The Wunderbar Foundation is the fundraising ‘arm’ of Wunderbar. 1. As a fundraising initiative, the Wunderbar Foundation functions on behalf of Wunderbar, raising money for Wunderbar’s projects and ensuring any profits from any Wunderbar endeavours are ploughed straight back into more projects. 2. As a fusion of academic and creative practice, the Foundation explore the ethics of fundraising and philanthropy, and investigates possibilities for creating stronger and more trustworthy relationships between those on both sides of the donation game through playful and thought-provoking mechanisms. Ilana Mitchell, Wunderbar’s Artistic Director, has been exploring these ideas with our Philosopher in Residence, Rachael Wiseman. Here’s Ilana’s explanation of how the Wunderbar Foundation came about. Like many folk who work in fields that rely on external fundraising, I’m not massively interested in money – certainly not in money-making. I’m even less of a fan of asking for money. However it’s dressed, there is always somewhere along the line a point where the thing you are passionate about, personally committed to, independently striving to create becomes subject to the decisions of other people. And it can be a bit of a buzzkill. So, why this new Foundation? Understanding that public funding, and oftentimes private giving, is tied to political agendas, I haven’t ever taken the ethics of fundraising, or where the money comes from, lightly, whichever government has been in power. But I began my career in the recent ‘Golden Age’ of public funding for the arts, under ‘new labour’ and I learned how to engage with that process. The intention from the government that came into power in the UK in 2010 was to begin a new wave of philanthropy for the arts – one that took American arts philanthropy as its benchmark. They made big public funding cuts in the hope of private money filling its place. Which, whether or not it worked, meant for us on the receiving end of these grants a necessity to diversify our portfolios of moneyraising tricks. 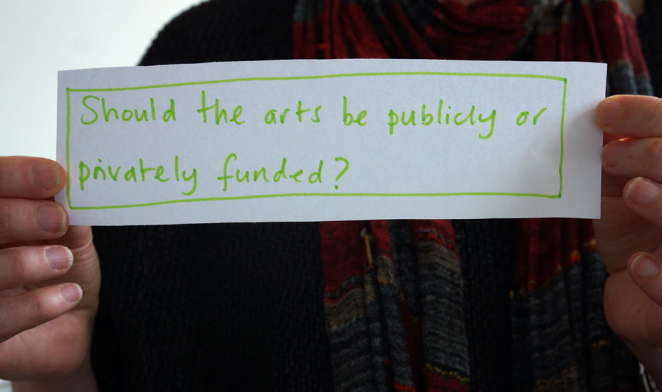 A few years back Arts Council England decided to try to support this change, by giving money to groups of arts makers to spend learning about how to fundraise from private sources. I took part in a scheme in 2014-2015 called Catalyst (as of Jan 2018 ACE has just allocated new round of this funding). And while being fascinated and learning lots about the ‘games’ and how to play them, I spent more fun times inventing my own new ways to find money. The idea for Edicure and the Wunderbar Foundation came out of that work. With the Foundation, I’m investigating ways to create a new donor initiative; open to those with cash they are able to give away, to donate to the Wunderbar cause. I have been working with Wunderbar’s Philosopher-in-Residence Rachael Wiseman, philosopher and instigator of the Integrity Project and together we’ve been getting to grips with some of the ethics and psychologies of private giving. We are considering whether it is possible to create a situation in which we can play with the power dynamics inherent in being a giver, or a recipient, of money. We’ve done lots of thinking, and we are starting to now talk about it – watch this space (and this video!) The Wunderbar Foundation will launch in March 2018. There is a reason why I chose to call the project “The Wunderbar Foundation.” It’s a new fundraising initiative, yes, and it needs a name, yes. Unlike in the US, or Finland, or many other countries, in the UK the term ‘Foundation’ has no legal definition. That doesn’t mean it isn’t used in the way we mean it – The Roddick Foundation, set up originally by Anita Roddick of The Body Shop, or The British Heart Foundation are good examples. But here in the UK, there are no laws on the term. The UK has ‘Trusts’ which do have a legal definition and, particularly relevant here, charitable trusts – more commonly, charities. Highly regulated. The British Heart Foundation is a charitable trust. It just has Foundation in its name. The Wunderbar Foundation is not a charitable trust. It just has ‘Foundation’ in its name. And it is an experiment, an art project if you like, that is creating an equivalent of a philanthropic body, able to, at its own whim and discretion, collect and allocate money without rules. It isn’t a charity with a governing document. Or in fact, any sort of organisation, though Wunderbar is. In other words, it’s an alternative name for our bank account.